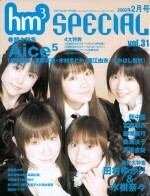 The front cover has Aice5 (Horie Yui, Kimura Madoka, Takahashi Chiaki, Asano Masumi, Kanda Akemi). The back cover has Tamura Yukari and Mizuki Nana. There is a folded poster with Aice5 on one side and Nonaka Ai on the other. Both are full body photos. 4 pages on Nonaka Ai. Interview about her first solo CD and first solo album. 4 pages on Miyazaki Ui. 4 pages on Iizuka Mayumi. 3 pages on Kuwashima Houko. Photos of Houko wearing a kimono. 3 pages on Takahashi Naozumi. 2 page interview with Morikubo Shoutarou and Takahashi Hiroki. 2 page interview with Okiayu Ryoutarou. 1 page interview with Seki Tomokazu. 2 page interview with Kawasumi Ayako and Yoshino Hiroyuki. 2 page interview with Minagawa Junko. 2 page interview with Noto Mamiko and Koshimizu Ami, about School Rumble. 2 page interview with Inamura Yuuna, Nakai Erika, Inoue Nanako. 1 page interview with Saiga Mitsuki and Nabatame Hitomi. 2 page column by Miki Shinichirou. 2 page column (about Da Capo Second Season) by Miyazaki Ui and Asano Masumi. 2 page article by Nogawa Sakura. 2 page interview with Kishio Daisuke. 1 page interview with Kouda Mariko. 1 page interview with Ochiai Yurika and Itou Shizuka. 1 page interview with Inoue Marina. 2 page event report on Tamura Yukari's Cutie Cutie Concert 2005 (2005.11.13 on Tokyo Kokusai Forum Hall A). 9 pages on Tamura Yukari and Mizuki Nana.